In the series Make Rave, not Hate we have the next dj-set. It is titled Make Love Part 2, because the first one was unfortunately non-free music. This summer set features some former netlabels like stadtgruen [stadt] or Music Artistry [MA] and some current labels like Broque [brq] or iD.EOLOGY [iD]. For the Melomania part we also have some 30 minutes of Drum&Bass for you. 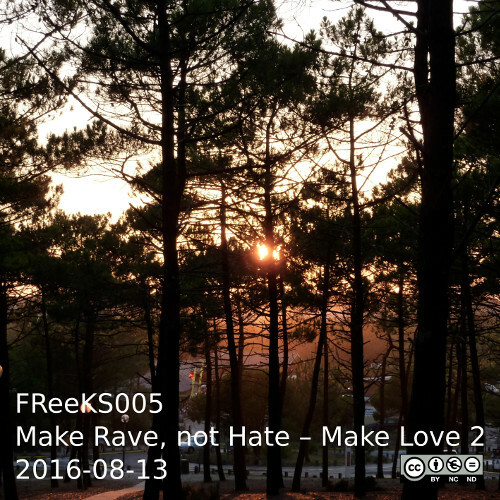 The dj-set DJ Robb – Make Rave, not Hate – Make Love Part 2 2016-08-13 has the label code FReeKS005 and is released under the terms of the CC license by-nc-nd. It has a play time of two hours and is released in lossy MP3 or Ogg Vorbis – see the Archive.org page for details; they have also a nice PDF cover image.